Song is a rapid, musical warble with a medley of melodious whistles and flute-like notes. 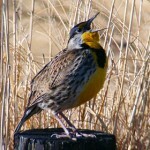 Description: Long, sharply pointed bill; conspicuous white wing bars; unnotched tail. Adult male has black head, throat, upper breast, back, wings, and tail; and brick red body. 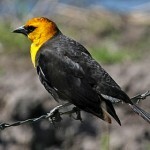 First year male is greenish-yellow overall with a black bib. Female is similar to first year male but lacks black bib. Behavior: Migrates south early (in July and August) compared to other birds. Habitat: Lightly wooded river bottoms, open country with scattered trees, shelterbelts, farmsteads, residential areas, and orchards. Where in Nebraska: Common spring and fall migrant and summer resident in eastern Nebraska, becoming less common in extreme western areas. 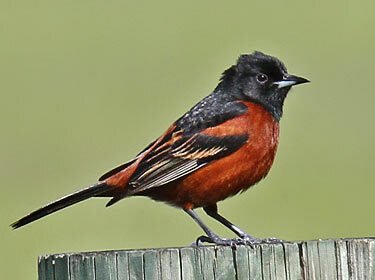 Fun Facts: The Orchard Oriole is a rather late spring migrant, but it heads back southward quickly. 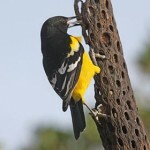 Some orioles may return to their wintering grounds as early as mid-July.